Arcata Police Chief Tom Chapman abruptly resigned his post April 10, sending a departmentwide email saying he felt the timing was right "not only for [him] but for the department." He offered no reason for his sudden departure, which was effective immediately. 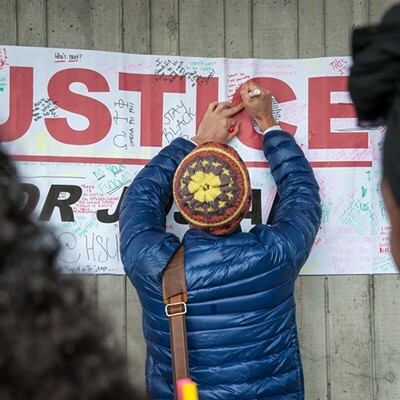 However, the Journal has learned that Chapman's resignation followed that of a consultant brought in to advise the department on the ongoing investigation into the April 15, 2017, killing of Humboldt State University sophomore David Josiah Lawson, who was 19. 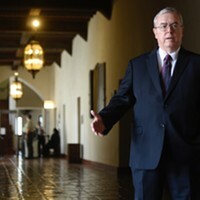 Reached after news broke of Chapman's resignation, Tom Parker, the former FBI agent who had been volunteering his services pro-bono as a consultant on the Lawson case, confirmed that he'd "regrettably terminated" his contract with the city April 9 and was stepping away from assisting the investigation. Parker declined to discuss any details of his decision or Chapman's resignation, other than to say he'd become "frustrated with a lack of cooperation" in the case. Asked if he'd consider coming back into the case now that Chapman has resigned his post, Parker said "that would have to be a topic of further discussion and negotiations with the city." The resignations come as the anniversary of Lawson's still unsolved killing approaches and amid an escalating outcry from HSU students and community members who have been critical of the city's handling of the investigation. 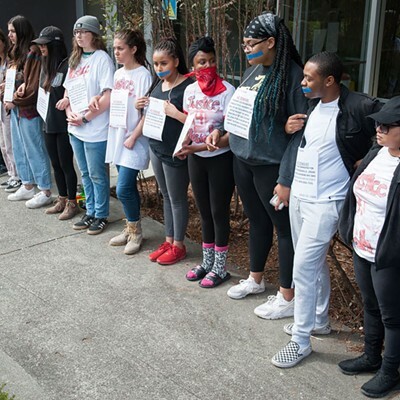 A student-led 12 days of action — with each day representing a month that Lawson's killing has gone unsolved — remains ongoing, with a celebration of life planned for Lawson Sunday at the D Street Neighborhood Center in Arcata. Throughout last week, student protests gripped the HSU campus. 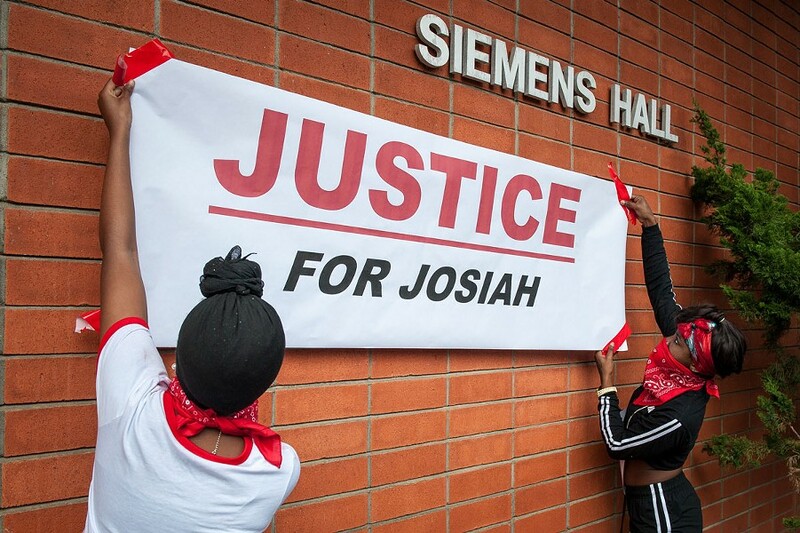 Students hang a "Justice for Josiah" banner on the Humboldt State University quad. At the rally, organizers encouraged those in attendance to scrawl messages of hope, unity and protest on it. On April 6, a male student lay splayed on his back, his hands folded in front of him, purple bruises covering his right eye and blood dripping from his nose, the work of a couple of make-up artists from the theater department. His female counterpart lay next to him motionless on her side, with a deep gash across her forehead, a trickle of blood falling from her split lip. Behind them, two students stood century with signs. 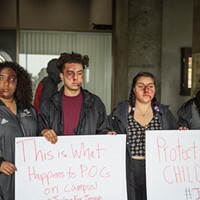 "This is what happens to (People of Color) on campus!" read one. "Protect your children!" read the other. 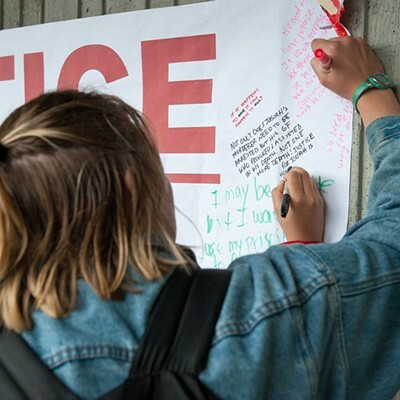 The silent protest was taking place outside Humboldt State University's "The J" dining commons on campus during a Spring Preview event for prospective students and their families, many of whom filed by the grisly scene. Some stopped to inquire what it was all about. A couple of student tour guides halted their regular itinerary in order to explain to the prospective students and their families what they were seeing. 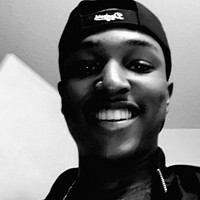 Lawson's killing is currently Arcata's only open homicide case going back decades and, from the start, it has fissured a community already rife with racial tensions. 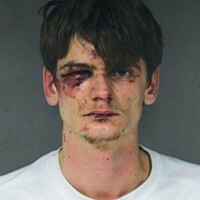 As Lawson lay bleeding to death from two stab wounds shortly after 3 a.m. on April 15, police found 23-year-old Kyle Zoellner, a McKinleyville man, battered and beaten at the scene and — after people on scene fingered him as Lawson's assailant — arrested him on suspicion of murder. Almost immediately, the case took on racial overtones as Lawson was black and Zoellner is white. One of Lawson's friends publicly alleged racial bias hampered efforts to get Lawson to a hospital in time to save his life and others alleged Zoellner's girlfriend used a racial slur to describe Lawson as he lay bleeding, saying she hoped he would die. The stabbing didn't occur in a vacuum. 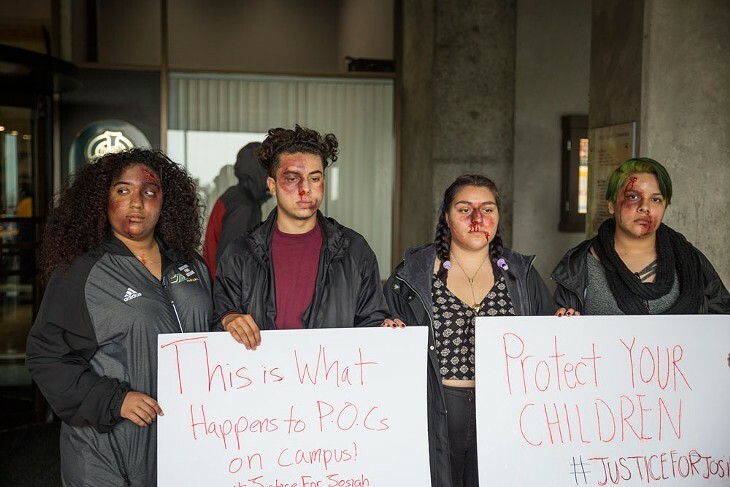 About a year and a half prior, two female black students reported that they were in downtown Arcata when two unidentified white men in a truck threw a beer bottle at them before continuing to "taunt, harass and chase them." 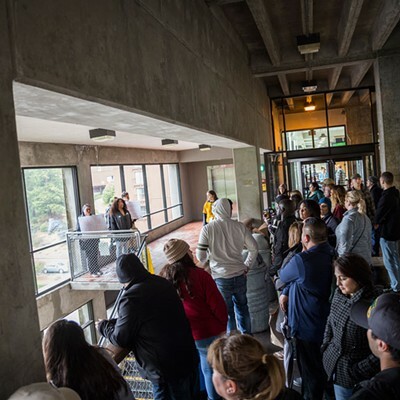 HSU President Lisa Rossbacher responded to the incident by sending out a campuswide letter saying the assault was racially motivated and not the first "incident like this" to happen on campus or in the community. "Harassment based on race, gender or other characteristics continues to be a serious problem," she wrote. About a year later, Rossbacher drew widespread backlash on campus when she sent another letter to faculty and students stating that "racism is not a norm on campus." 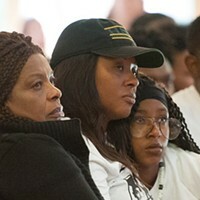 In October of 2016, the university convened a couple forums on racism, both of which were widely attended and saw frustrated students speak out about what they deemed pervasive instances of overt and subtle racism in the community, and blasted the university administration for not doing more to support students of color. With that history as a backdrop, some quickly came to see Lawson's killing as a potentially preventable result of unheeded warnings. Tensions escalated further on May 4, 2017, when after a two-week hearing that saw dozens of witnesses testify, Humboldt County Superior Court Judge Dale Reinholtsen found police and prosecutors had gathered insufficient evidence to hold Zoellner to stand trial on the charge that he'd murdered Lawson and ordered him released from custody. Reinholtsen explained that there was no physical evidence linking Zoellner to Lawson's killing and, while numerous witnesses testified that the two men had been engaged in a fight, along with others, no one said they had actually seen the stabbing. 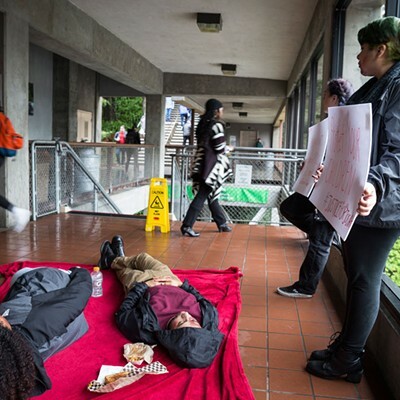 A string of protests followed the ruling, with hundreds of people marching through campus, the streets of Arcata and congregating on the plaza. 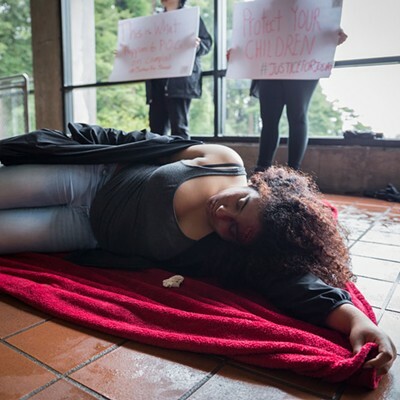 In the following weeks, demonstrators would flood Arcata City Council chambers during meetings to demand updates on the investigation into Lawson's death and action to ensure people of color are safe in the community. The city later agreed to offer regular Lawson case updates in a separate forum but that seemed to add to simmering frustrations when the police department released only very limited information, citing the need to protect the integrity of the ongoing homicide investigation. Over the ensuing months, the city also held a series of dialogues on race, which saw students and community members of color step to the microphone to describe feeling unsafe and discriminated against in the community. At the last such meeting in March, some questioned why minorities are being asked to repeatedly and publicly revisit these traumas in order to validate that the problem is real and pervasive. 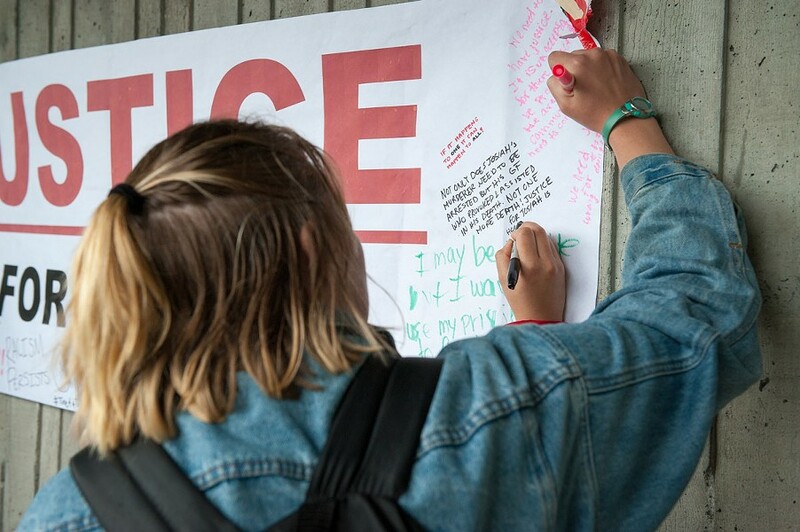 A student signs the "Justice for Josiah" banner. And throughout all this, the Arcata Police Department's investigation has quietly continued with Zoellner remaining the only publicly named suspect. The department released its last public update on the case in February, reporting that it continues to work "through a defined investigative strategy based on all the physical evidence and witness statements, much of which has been developed after" Zoellner was released from custody in the case. Additionally, the department reported that it has interviewed almost four dozen people as a part of its investigation. Back in August, then-Police Chief Tom Chapman said the California Department of Justice's crime lab had returned some forensic testing results, some of which were "very valuable," adding that one "key piece of evidence" would necessitate further DNA testing. The department also agreed last fall to work with Parker, a 73-year old former FBI agent who most notably led the bureau's investigations into the Rodney King beating and the Rampart scandal in the Los Angeles Police Department. Parker was given access to the complete investigative file in the Lawson case in order to give APD feedback and advice, Chapman said. Parker has now walked away frustrated and Chapman, who had pleaded for patience in the investigation, has resigned. 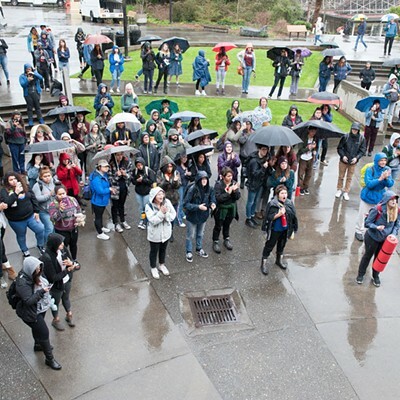 And on campus, anyway, patience seems in short supply.On April 5, students walked out of class and gathered in the pouring rain on the university quad to hold a rally. Huddled under umbrellas, the students pressed a couple of university administrators in attendance for answers. They asked where Rossbacher was, why she hadn't been attending the community dialogues on race. They pressed for answers on what the university was doing to keep pressure on the police to resolve the case. They chanted Lawson's name. They demanded to know why their administrators deserved their faith any longer. HSU Vice President of Academic Affairs Alex Enyedi stepped up to address the crowd. "I believe with all my heart in justice for Josiah," Enyedi said, explaining that in the days after Lawson's death, he was one of the first representatives to meet with Lawson's mother. "We talked about David, we talked about the tragedy and we cried and we cried." "This thing has hit me really hard and I understand your grief and I understand your anger, because it pisses me off, too," he said. "I understand it shouldn't take this long and I understand there needs to be more done. ... I feel your pain. I understand the frustration." A few moments later, student Barbara Singelton picked up a megaphone and urged those gathered to stay engaged, to stay active and to keep pushing. "The fact of the matter is he was a student, he was murdered and it could have been any of us," Singleton said. On the anniversary of Lawson's death, students and community members will gather on the Arcata Plaza at 3:30 p.m. for a vigil before walking to the D Street Neighborhood Center, where a celebration of his life will be held from 4:30 to 8:30 p.m. Tickets for the evening — which will feature music and Jamaican and soul food — are $3 for students and $5 for community members, with proceeds going toward "continuing investigation efforts." For more information, contact the HSU African American Center for Academic Excellence at 826-4588. Meanwhile, what Chapman and Parker's departures mean for the Lawson investigation remained unclear as the Journal went to press.